In a weird way I mean this as a compliment; Gifted is only one step up from a Hallmark movie. But that step is a big, important one, and it does change the tenor of the label. Basically, Gifted is like a Hallmark movie in set up, delivery, and conclusion, but not in talent level, and therein lies the difference. 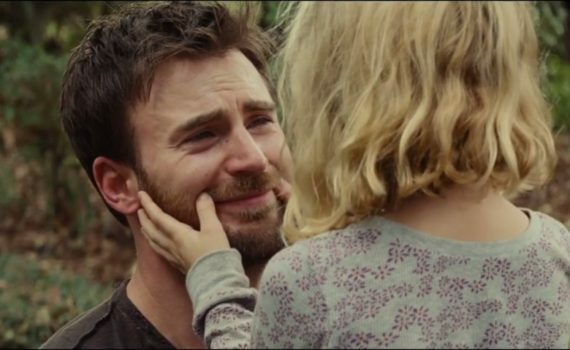 Captain America takes a break from his busy schedule to play a single dad, and he gets it mostly right, which is another big reason that the film works at all. Because, again, it probably shouldn’t, given the recipe that it follows, a path that we’ve mistakenly stumbled down before. But we trepidatiously return for more, we are tempted this time by a seemingly capable cast, and in the end we are surprisingly rewarded by something slightly better than it really ought to have been. Frank Adler has been taking care of his niece Mary since her mother died and she left the girl in his care. He ran away from his problems in Boston to the Gulf shores of Florida where, instead of using his advanced intellect for something useful, he fixes boats and asks for nothing more out of life. Brains run in the family, and Mary is no exception; now that she’s in school she’s very quickly showing that she’s smarter than everyone there. Actually, she’s a genius like her mom, and her teachers want her to attend a special gifted program. So does her grandmother, Evelyn, a woman who now enters the picture and demands that she be given more access to Mary, and if Frank won’t give that to her she’ll demand it in court. Mary and her father figure are torn apart as the adults in the room try to make all the decisions, a scenario that never ends as perfectly as it is planned. This film is definitely sappy, but in a good way, like pure maple syrup; you know it’s not great for you but at least it’s much better than that gooey fake stuff in the bottles shaped like an angular building or a round lady. That’s why I call this movie Hallmark, because it has that level of sugar and tells a very similar tale, but thank god it comes out stronger by the end. Chris Evans has really come into his own, and he’s proving that he’s not just a handsome face. Mckenna Grace is an adorable kid, and hopefully her talent pans out, because it looks wonderfully promising. Lindsay Duncan is a veteran, so she’s fine, and Octavia Spencer plays the nice lady next door who loves Mary unconditionally, so try to pretend that doesn’t float your boat. The big flaw is Jenny Slate as the love interest, kinda, it’s hard to explain. I just know she isn’t good and doesn’t fit, which it really the only major problem. Otherwise, the movie is forgivably cheesy and actually really smartly written, with many moments throughout the dialogue that impressed me with either wit or placement. Watch Gifted for a fairly easy evening with a predictably tear-jerky story and you won’t be disappointed.